Deep within a valley in the Jura Mountains, in the town of Le Locle, stands a traditional Swiss villa which is home to Montblanc Montre S.A. 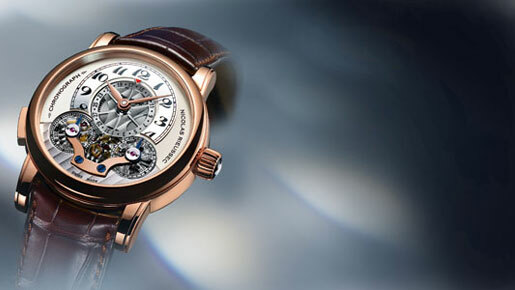 Here Montblanc develops its exclusive watch lines. As one of an elite group of watchmakers who design, develop, and produce their own calibres in-house from start to finish, Montblanc Montre S.A. has earned its right to the coveted title of manufacture. The mission of the Montblanc manufacture is to combine the time-honoured traditions of Swiss watchmaking with the state-of-the-art technology and innovative ideas to create timepieces of the utmost precision, perfection, and durability. This ability to fuse the old with the new is perfectly expressed in the Montblanc Nicolas Rieussec Chronographs – a watch series that inherits a centuries-old tradition of craftsmanship and advances the art of watchmaking to new heights. Fittingly for Montblanc, it also has its own unique story to tell. 85 years before the founders of Montblanc looked to the Mont Blanc massif as the symbol of their highest ideals, an inventor named Nicolas Rieussec made history at a Parisian racecourse when he accurately timed each horse to within a quarter of a second as it crossed the finish line ñ a feat never before accomplished in the history of timekeeping. Combining the Greek word for time, “chronos” and “graphein” meaning to write, Rieussec had invented the very first chronograph. His machine literally “wrote” time using two rotating discs for seconds and minutes beneath an ink filled marker. By pushing a button, the tip would come into contact with the dials, leaving a readable mark to measure the time. Inspired by the original mechanism developed by Nicolas Rieussec, the Montblanc Nicolas Rieussec chronographs feature two fixed hands and beneath them two rotating discs ñ the second and minute counters. This method of measuring time is unique and ensures that the face of these chronographs differs entirely from that of traditional chronographs. In addition to a classical column wheel and an innovative vertical disc clutch that runs virtually friction free and does not affect the watchís rate they are equipped with twin barrels that store enough energy for the watch to run for 72 hours. Montblanc augmented this unique chronograph display in 2009, when it introduced the Open Date model, in which the dial and the elapsed-time discs are partially skeletonised to offer unobstructed views into the depths of the movement. The intricate precision mechanism of these chronographs once again bears witness to the handcraftsmanship of Montblanc Montre S.A., which satisfies the high standards of the art of traditional Swiss watchmaking. In 2010, the watchmakers at the Montblanc manufacture achieved a remarkable symbiosis by combining Nicolas Rieussecís traditional chronograph principle with the most modern material: silicon. A new limited-edition model encasing a movement in which the lever and escape-wheel are made of silicon, a material that embodies the state-of-the-art horological artistry. Thus the Montblanc watch manufacture unmistakably underscores its intention of setting new accents in the technical inner lives of timepieces. Silicon is 60 percent harder and 70 percent lighter than steel, highly resistant to corrosion and entirely nonmagnetic. When silicon is processed by the DRIE method, the resulting surfaces do not need post-processing because theyíre already absolutely smooth and scratch resistant. These are precisely the qualities that watchmakers and engineers have always sought ñ because such attributes significantly improve a watchís rate and durability. The fact that the lever and escape-wheel of a movement oscillate at a pace of four hertz and must be accelerated and halted 28,800 times each hour makes it clear how crucially important it is to reduce the masses of these components. In a watch composed of a steel lever and escape-wheel, the escapement alone absorbs more than 60 percent of the energy. Reducing the mass by 70 percent means that the escapement requires significantly less energy, so more power is available to maintain the stability of the balanceís amplitude and to lengthen the power reserve. The nonmagnetic properties of silicon, on the other hand, are important in a world thatís becoming increasingly permeated by the electromagnetic fields associated with modern communications and entertainment electronics. And siliconís inherent hardness reduces wear and improves durability. The Montblanc manufacture automatic calibre MB R200 features a rotor, which is fitted with a heavy metal weight to maximise its winding efficiency. It is controlled by a traditional column wheel. With its high moment of inertia (12 mgcm2) and a frequency of 28.800 beats per hour (4HZ) the large screw balance delivers an extremely stable rate. The Montblanc Nicolas Rieussec chronograph automatic shows the time in two different time zones at a glance: The owner`s reference time back home, and local time in his or her present location. A window display indicates whether it is day or night back home, another aperture shows the date. Available in a silver or anthracite dial with black numerals on the applique hour circle, this timepiece features a 43mm stainless steel case, 72h power reserve, hour and minute, date display, second time zone with day/night display, 30 minute and 60 second rotating disc counters, sapphire crystal case back, domed sapphire crystal with anti-reflective coating, water resistant to 3 bar (30m). The strap is available in brown or black alligator skin with a double-folding clasp or as a stainless steel bracelet with triple-folding clasp. With generations of precision watchmaking expertise visible in every detail, each of these handcrafted watches is a genuine treasure expressing a heritage of craftsmanship and creativity.